After Nearly 2 Weeks and 2 Recounts, Florida Senate Race Ends Nearly two weeks after Election Day, a statewide recount showed that Republican Gov. Rick Scott continued to hold the lead in the Senate race against incumbent Democrat Bill Nelson. 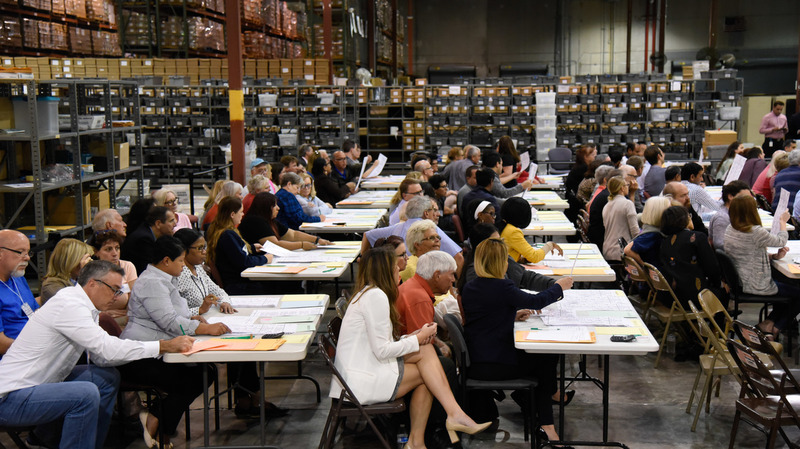 Volunteer observers keep watch Friday as election workers at tables examine ballots during a hand recount of votes cast in Palm Beach County for the U.S. Senate race. According to official results from the Florida Division of Elections, current Gov. Rick Scott, a Republican, was ahead of Democratic Sen. Bill Nelson in the contested Senate race. Scott's lead narrowed slightly to about 10,000 votes. Scott announced that Nelson had called him to concede. Official results were due to Secretary of State Ken Detzner's office from Florida's 67 counties at noon on Sunday. About an hour before that deadline, Broward County, which has been one of two counties at the epicenter of the state's recount drama, announced that it had completed its recount and submitted the results. Because the margin between Nelson and Scott was less than a quarter of a percentage point after the first recount, state law mandated a hand count of ballots that a machine could not make a clear reading on, either because the race was left blank or because there were other markings that made the ballot unclear. The results turned in by county election officials on Sunday will reflect those recounted totals, as well as ballots received from military and overseas voters. As long as ballots from abroad were postmarked before Nov. 6, they will be counted if they were received by county officials by Friday. A federal judge has denied a number of lawsuits filed by Nelson in an effort to put a dent in the deficit. They included a request to count vote-by-mail domestic ballots that were received after Election Day and a request to nullify a state law that requires voters to use the same marking method for different races across their ballots. In a statement issued Sunday, the Scott campaign said Nelson has a choice: "Be remembered as the statesman who graciously conceded after 42-years of public service ... or be remembered as the sore loser who refused to face the people he served." The Democratic nominee for governor, Andrew Gillum, conceded Saturday night after concluding his own recount would not sufficiently close the gap with his opponent, Republican Ron DeSantis. In his concession on Saturday, Gillum referenced the tangle of election administration issues that these midterms uncovered, 18 years after the state first came under harsh scrutiny for the 2000 presidential election. "We're going to everything that we can to make sure that over the coming weeks and over the coming months that we do what we can to perfect our electoral system," Gillum said. "We need to update Florida's elections system and bring it into the 21st century."